Without changing the food they ate, and simply following the 3-stage process, clinical studies have shown individual weight losses of 27lbs in four weeks and 42lbs in eight weeks. The average weight loss for all participants in the study was 36lbs in just over two months. Most weight loss supplements stop working after a few weeks because your body gets used to them. 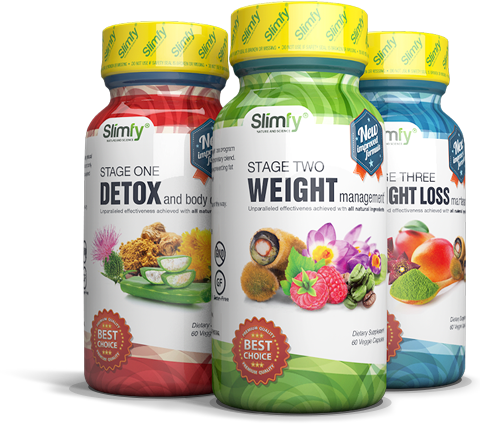 Through a unique 3-stage process, Slimfy overcomes this tolerance effect It continues to work for you until you stop taking it. This is the key factor that has enabled people all over the country to lose up to 42lbs in just two months. It’s no ordinary diet pill. We want you to see what Slimfy® can do for you . Once you start, there really is nothing else to do. Just follow the instructions and you can reverse years of overeating. Let us get you in your normal constitutional weight.